Our Friends Carol and Jerry took me to two Tamarack swamps that are nearby in Buffalo County. Tamaracks (Larix laricina) are unusual trees because they are deciduous conifers. 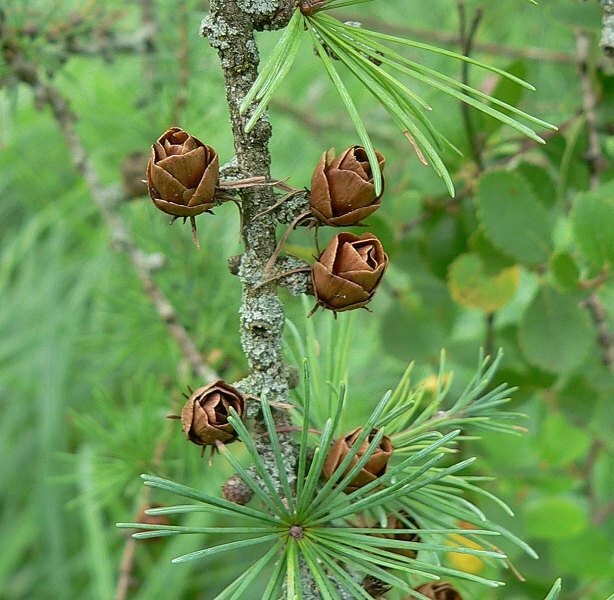 Their seeds are enclosed in cones and they are related to spruces and pines, but they shed their needles in the fall, and grow new ones in the spring. 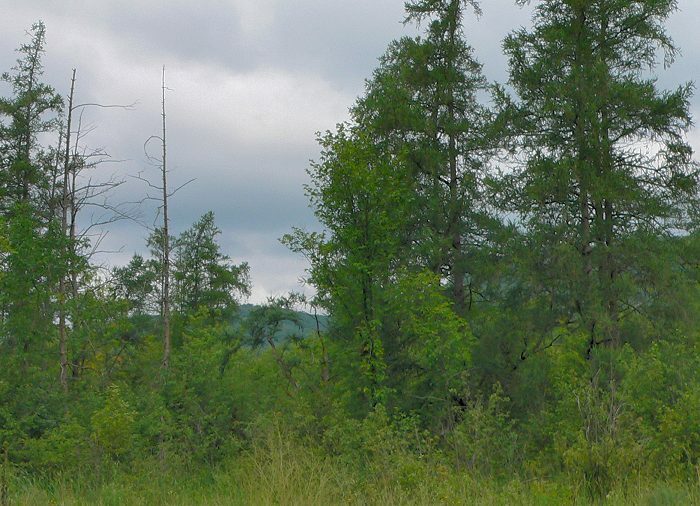 Most of Wisconsin’s Tamaracks are in northern Wisconsin where they grow in bogs – acidic wetlands. Southern Tamarack swamps like the ones we visited are called Tamarack Seepage Swamps, and are calcareous, rather than acidic. There aren’t many left – most have been drained and cleared for agriculture. This is the first one we visited. 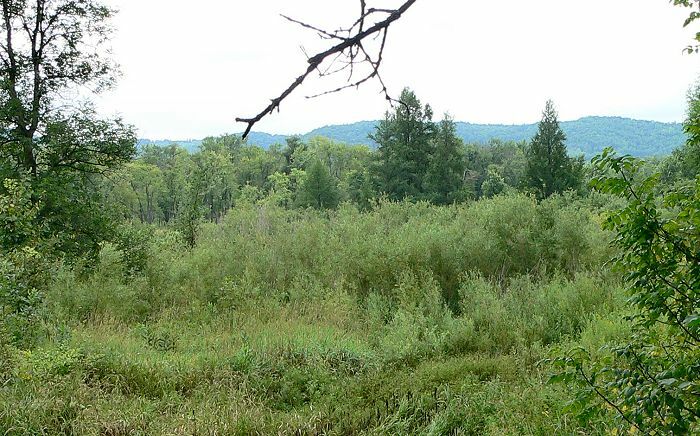 It’s at the edge of an extensive wetland along a slow, winding river. There are several dozen Tamaracks, all large and old – we couldn’t find any young trees. Under the tamaracks is a shrub layer of Alder (Alnus sp. )and Bog Birch (Betula pumila). The ground is very wet, with mucky places and small pools of dark water. 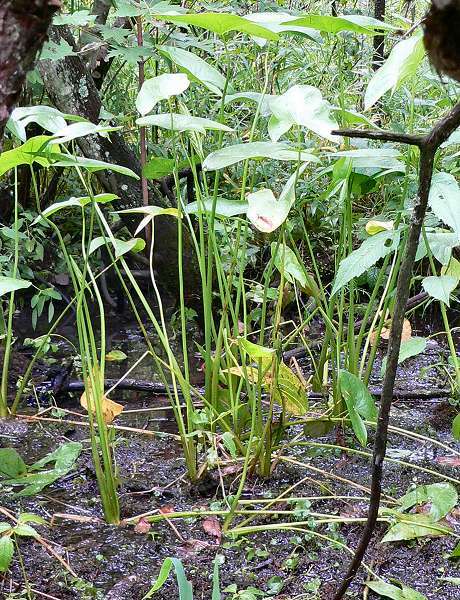 It’s difficult to walk because of the mud and water, and because the understory plants are tall, and there are many fallen trees and branches. Tamarack Swamp with Arrowhead leaves. Pool of water next to Tamarack roots. Arrowhead leaves growing in mud. We saw Skunk Cabbage (Symplocarpus foetidus), Marsh Marigolds (Caltha palustris), Arrowhead (Sagittaria latifolia), Marsh Fern (Thelypteris sp. 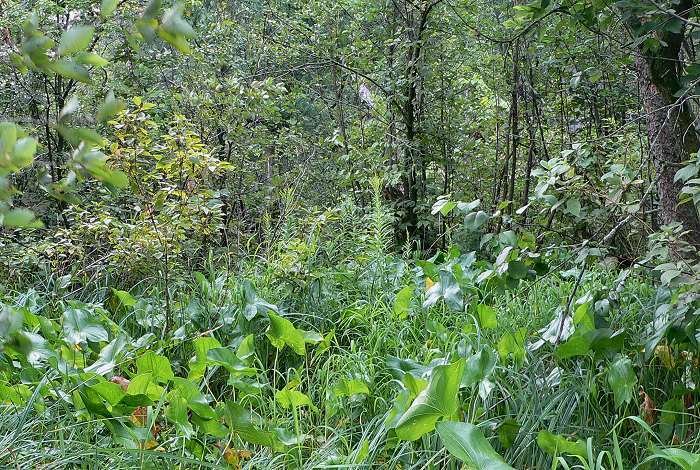 ), Sweet Flag (Acorus americanus), Jewelweed (Impatiens capensis), grasses and sedges in the ground layer. We found Dodder twining around some plants. 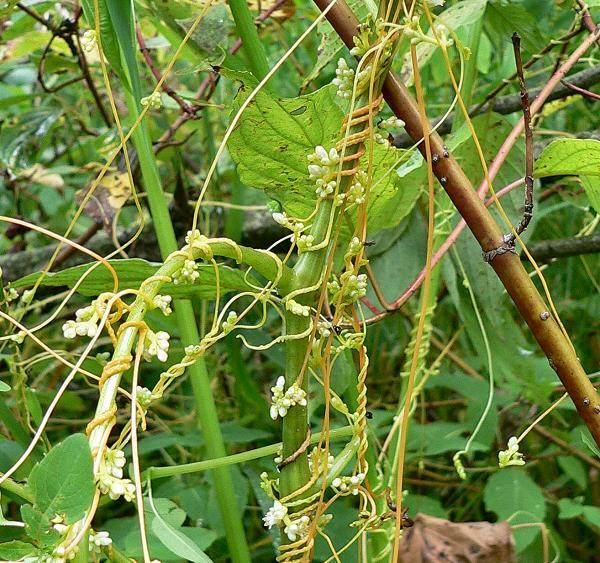 Dodder is a parasite with no green coloring at all. The stems are orange, and the flowers are tiny and pearly white. The best find was just as we were leaving – we found numerous plants of one of the Lady’s Slippers. It’s either Showy Lady’s Slipper, or one of the Yellow Lady’s Slippers. We found the leaves and seed pods, but the flowers were finished. 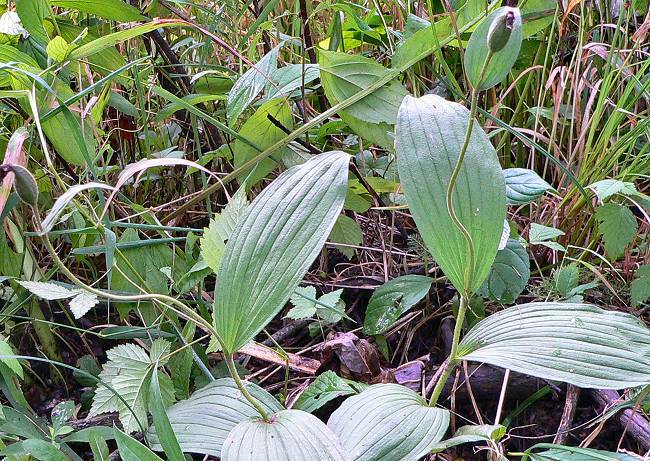 Both the Showy and the Small Yellow Lady’s Slipper are listed as species of special concern in Wisconsin. 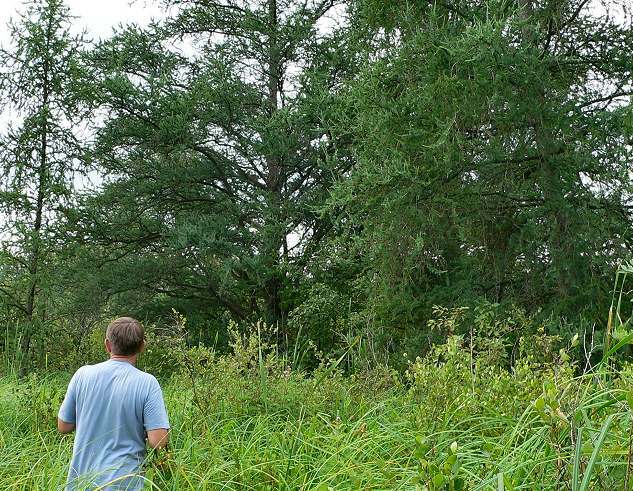 The second swamp had a smaller area of Tamaracks, in a large, beautiful wetland. It was easier to walk – there weren’t as many fallen trees and the ground was a little less mucky. There were various ages of Tamaracks – some young trees as well as some big older ones. 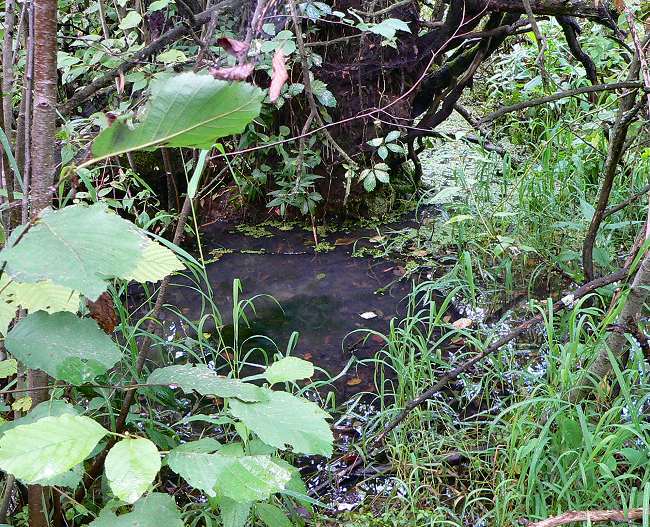 The shrub layer was Alder and Bog Birch, the ground layer had more normal wetland plants than the first swamp. We saw Marsh Marigolds, Arrowhead, lots of Marsh Fern, Swamp Hemlock, and Scullcaps. We walked a little in the area around this swamp, which had some overgrown Savanna and an extensive wetland with a trout stream. 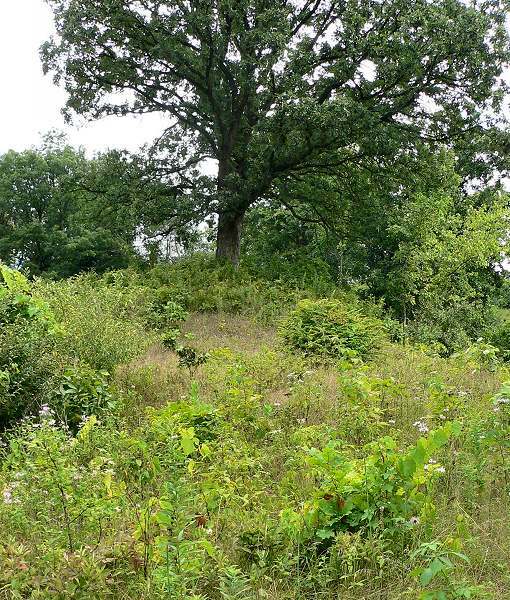 Savanna hillside with an open grown Burr Oak. 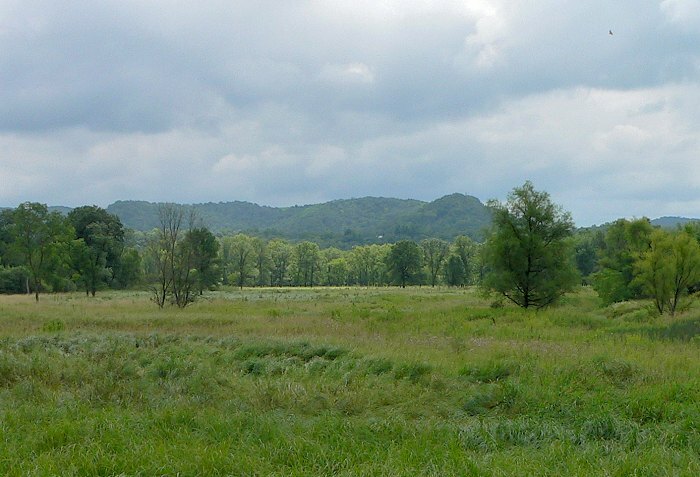 A view of the wetland area. As we looked out at this scene we could see two young Bald Eagles circling and chasing each other, and at least 6 Turkey Vultures flying high above them.